At FPA, our core values represent who we are. They describe our intended state of being. They are so integral to our being that we would not abandon them even if we were penalized for holding them. We want to attract as members those who share our values. Our dedication to competence requires not only lifelong learning, but also that we continually assess our ability to appropriately and effectively address the needs of those we serve. We strive to have ever more congruence between our words and deeds, and to deliver genuine value to those whom we serve. We are committed to open, inclusive and respectful relationships, including collaboration among diverse parties on common interests. Our Business Objectives describe actions we will take to achieve our Primary Aim. We seek to accomplish this through strong and active leadership in partnership with FPA’s community of chapters. 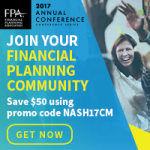 Unify the voice, focus and resources of the financial planning community, bringing together those who champion the financial planning process. Facilitate the success of our members and grow the organization. Cultivate the body of knowledge of personal financial planning. Advance awareness of the characteristics of professional financial planners and support the standards of the CFP® certification in order to serve the public. Define and effectively communicate a common understanding of the discipline of personal financial planning and the benefits of its use.